Finance Commissioner Andy Pallito (left, end of table) and James Pepper, the Shumlin administration's director of intergovernmental affairs and policy adviser, address the Senate Finance Committee. A Senate committee has zeroed in on a 25 percent tax to be charged for legalized marijuana, as lawmakers consider legislation to allow sales starting in 2018. The Senate Finance Committee is expected to vote on the tax by the end of the week. The tax — along with fees that would be charged to those growing, testing and selling marijuana — would bring in an estimated $6.9 million in 2018 and $14.4 million in 2019, according to the legislature's Joint Fiscal Office. 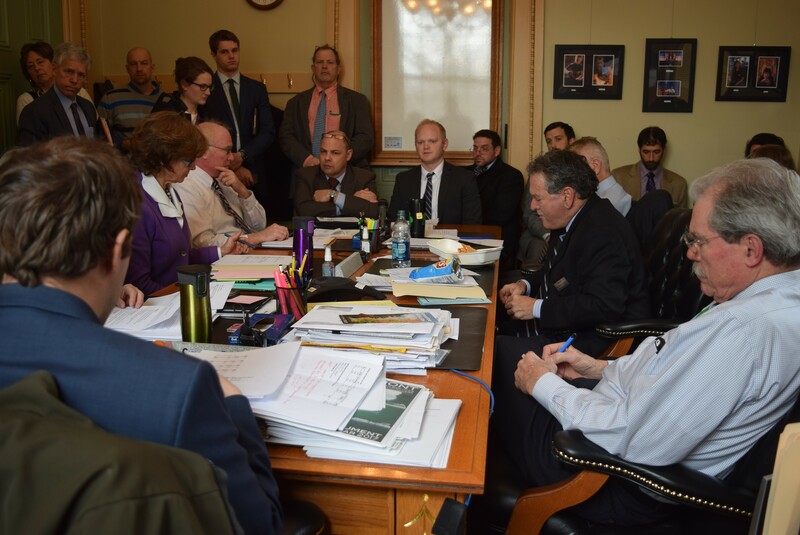 Senate Finance Committee chair Tim Ashe (D/P-Chittenden) said the estimates are conservative and are made on the premise that the state would permit 25 retail stores, 15 small cultivators and 10 large cultivators in the first year, with more the next year. The 25 percent tax is the same rate that Oregon started charging this year, Ashe said, but less than the 37 percent Washington state charges. The Vermont proposal would be an excise tax charged on marijuana sales made at stores that sell marijuana. The rate at which marijuana is taxed is a key decision, which will influence whether a legal market can compete with the black market while still raising enough money to provide the drug counseling and policing that advocates have promised. But there are questions about whether the marijuana legalization bill will even reach the Senate floor this year, let alone make it to a more reluctant House chamber. As it stands, the bill lacks support to pass the seven-member Senate Appropriations Committee, which is scheduled to start considering the issue next week. All eyes are on Sens. Jane Kitchel (D-Caledonia) and Diane Snelling (R-Chittenden), two members who say they have concerns about legalization, but haven’t decided how they’ll vote. Both Kitchel and Snelling are likely needed for the bill to pass out of Senate Appropriations. "The key vote is going to be in there," said Senate President Pro Tempore John Campbell (D-Windsor), an Appropriations Committee member who opposes legalization. On Wednesday, Kitchel, the Appropriations Committee chair, met with Gov. Peter Shumlin’s staff. “I haven’t really made a decision yet,” she said afterward, citing public health and safety concerns. Three members of the committee — Sens. Alice W. Nitka (D-Windsor), Robert Starr (D-Essex/Orleans) and Campbell — have all indicated they oppose legalization. There are ways for the bill to advance without a majority vote. A member who opposes the bill might be persuaded to vote in favor, so that the full Senate can have the debate. Or the committee could choose to send the bill to the floor with a negative recommendation. Other concerns about legalization continue to circulate in the Statehouse. The Senate Economic Development, Housing & General Affairs Committee has been grappling with whether the rules surrounding employee drug testing are sufficient to protect employers. The Senate Transportation Committee has been hearing a slew of concerns from police agencies. This week, Shumlin administration staff unveiled a plan to the Senate Finance Committee that jettisons an earlier plan to add eight new troopers in 2017 — delaying that until 2018. Finance Commissioner Andy Pallito also presented a plan by which a small amount of the estimated $2.21 million start-up costs for administering legalized marijuana would be spent in 2017 with money borrowed from 2018. That's potentially an unprecedented approach.